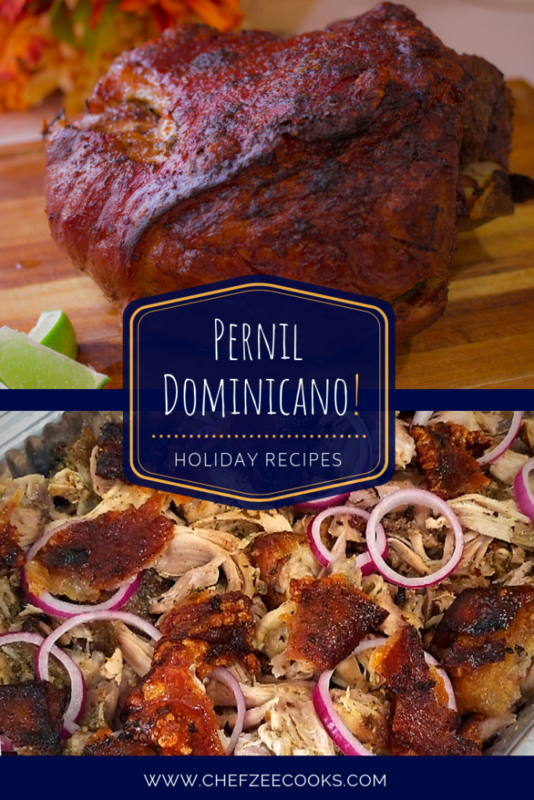 Pernil is an absolute must have for the holidays especially Christmas! Dominicans, Puerto Ricans, and Cubans have pernil in heavy rotation in November and December. If you’ve never had it, then your mind is about to be blown because pernil is super tasty. Pernil is roasted pork shoulder and if you’ve had pulled pork—which uses the same cut of meat—then you know that pork shoulder is tender, juicy, and flavorful. There are ton of different ways to making pernil. Believe it or not, there’s also a ton of traditional ways to making pernil as well. It really varies by family, region, and country. Today I’m sharing the recipe that my grandmother taught me. Cover pernil with saran wrap and let it marinade for a minimum of 4 hours. Best to marinade for a whole day. In a LARGE pot, add pork—skin side up—and add 1-2 cups of water. Be sure to include all of the marinade that in the mixing bowl. Boil for 45 mins to an hour. Switch Pork—skin side up—to a sturdy pan and roast covered for 3 hours at 350 degrees making sure to baste it every hour. The pernil will become light golden brown and juicy during this time. This recipe is deceivingly simple since it doesn’t use THAT many ingredients. It’s mostly salt, bitter orang, lime, oregano, and tons and tons of garlic. The more the better, no? The trick to making Pernil is seasoning it sufficiently with salt and this ultimately comes down to personal preference. Pork shoulder sweats out salt so you have to add a lot of salt so you don’t end up with a bland dish. You also have to keep in mind, that pork shoulder is a big thick piece of meat. This is why we poke holes in it to make sure some of the marinade gets inside. This is also why when we serve the dish, we pull the meat and serve it with a combo of outside pieces and inside pieces. The outside pieces are my FAVORITE since they’re the most flavorful. Now back to the salt—different recipes will call for different amounts of salt and again, I stress that this comes down to personal preference. After YEARS of making this dish with grandmother, aunt, and on my own I’m cracked the code to salting a pernil. Hear me out—The max amount of salt you should use is HALF of the pork shoulder’s weight in tablespoons. Confused? I’ll explain. Say you have a 10lb pernil, the MAX amount of salt you should use is 5tbs. This will give you a very well-seasoned pernil. Anything more than 5tbs will give you a salty pernil. Now you if you like your food on the saltier side, then hey—go for it and add more salt. I won’t stop you. You can also use less salt but I wouldn’t recommend using less than 2 ½ tbs of salt (25% of a 10lbs perni’s weight). If there’s anything you want to do is avoid a bland pernil. Bland pork shoulder is never fun. You just get the sense that something is missing. Long story short, pay attention to how much your pernil weighs because this will dictate how much salt you should use. Moving onto boiling the pernil. Before I roast the pernil, I like to boil it for 45mins to an hour. This step is optional but I find this step to be crucial in getting a juicy pernil. Boiling the pernil with 1-2 cups of water helps the seasonings penetrate the inside and it creates a ton of au jus (gravy)! This step is simple. After your pernil has been marinating for 1-2 days, boil it for up to an hour—a little bit more if your pernil is big. Then use a sturdy pan and slow roast it at 350 degrees. Keywords: sturdy pan. I typically use the 2 disposable aluminum pans. Roasting the pernil is also fairly simple. Depending on the size (Average is 7-10lbs) of your pork shoulder, you’re going to roast your pernil for 4-5 hours. For the first 3 hours, you want to roast the pernil covered with aluminum foil. Check on it every hour and baste it. This is the 2nd phase of cooking a super juicy pernil. (Say no to dry pernil!) Cooking it covered will create so much gravy—you’ll be amazed. After roasting it covered for 3 hours, baste it one last time and remove 50% of the gravy and set that aside. At 3 hours, your pernil should be almost all the way cooked, and you’ll know this because the juices coming out of the pernil will be clear and your pernil with be a light golden color. The skin won’t be crispy—but we’ll get to that part in a bit. If the juices flowing from the pernil aren’t clear by the 3rd hour, then continue to cook it covered for another 45 mins to an hour. DON’T remove the gravy until it’s that light golden color and the juices from the pernil are clear. Now if that you’ve roasted it covered for 3 hours or longer – some pernils are stubborn a take a little bit longer—you’re going to remove half of the juices and roast it UNCOVERED for an hour. This is the hour where magic happens. This is the hour where the pernil becomes a light to medium brown color and begins to crisp up. I LOVE LOVE LOVE a crispy skin so sometimes, I let it roast uncovered for a little more than an hour. Remember, that the pernil has cooked almost all the way during the first 3 hours and now during this last hour we’re browning it. However, we won’t be sacrificing juiciness because we’ll be basting it during that last hour as well. In the end, it’s completely optional for you to place the pernil on broil for 5 minutes or more. Doing this will give you super crispy skin aka chicharron! If you decide to do this step, please keep a close eye on the pernil because you don’t want to burn it. Feel free to shred the pernil and serve with lime! Please let me know if you have any questions and click here to watch my YouTube video on How to Make Pernil Dominicano! I go step by step as I did in this post. Last but not least… What to do with that gravy that we removed? Well, if your pernil dries out while you’re roasting it uncovered, then add some of that gravy. You can also add a little bit of that gravy once you’ve shredded the meat. Another option is that you could strain the juice and add it to melted butter mixed with flour to create your own pernil gravy that tastes delicious over the pork or mashed potatoes. You could also use the juice to create the base of a soup or you could discard. The possibilities are endless. Nope! Lol When I say Sopita I’m referring to Chicken Bouillon Cubes which you can find in many stores. I realized early on that Sopita is one of those Dominican words that slipped into my videos and posts that not everyone knew about. Apologies! I have more details & tips on sopita on my YouTube channel. Thanks for coming by!